Floor lamps can bring either a subtle accent light to a room or serve even as the primary light source depending on your configuration and other lighting fixtures you're using. A torchiere floor lamp, for example, is a floor lamp that directs a large amount of light upward, whereas a more traditional floor lamp will generally provide a balance of light both upward and downward. 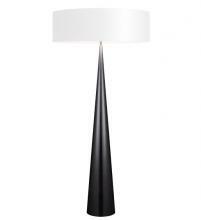 Many floor lamps have adjustable brightness and they generally range from four and a half to six and a half feet tall.